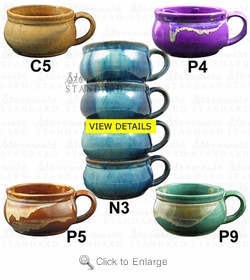 "PERFECT STACKING" STONEWARE SOUP MUGS"
Ideal for heating and serving soups, chilis, stews, etc.Holds an 18-oz can of your favorite soup. Comfortable handle will not get hot when micro-waved. For French Onion soup, place about 4-5" below the broiler to melt cheese and crisp croutons. If baking individual casseroles, use foil over the top during baking. Handle will get hot if used in the oven - always use a pot holder.